Born in 1990, I grew up in a world that was growing ever-closer with unprecedented speed. Every day as a teen when I opened the newspaper I would sure enough find yet another step towards a unifying world. International trade was mostly flourishing, visa-free travel was introduced across more and more countries and the EU was adding new nations to its club quicker than most people could make new friends. It was only a matter of time, surely, until we would live in some kind of world peace utopia. Even the attacks of 9/11 seemed for many years like a horrendous crime but not something that would substantially reverse this course of world integration. Other terrible steps back in civilisation such as the Rwandan genocide were in the words of Bob Dylan ‘far away’ and the second world war was of course ‘long ago’. It is curious to see how everything seems to be fine until problems or indeed any major changes hit home. This is essentially what has happened. It only took the usual recipe of technological change, economic crisis/ stagnation and waves of immigration at home to cause enough political angst among European society to resort to supporting extreme parties and voice previously unimaginable political opinions publicly. Something I was always struck by is how quickly public sentiment can change and what consequences it can have. My own family experienced this a while ago. One day you’re a successful member of German society with ancestral roots stretching back generations and the next you aren’t welcome anymore because of your religion, political opinions or other reasons. There are already right-wing demonstrators across Europe gathering each week along with the political agitators seizing the opportunity. Could Merkel be impeached and Europe unravel in a subsequent crisis fuelled by Brexit and a returning Euro-crisis? Unfortunately, the chance of that happening is far from naught. People started describing such unforeseen events and statistical outliers as ‘black swans’ that can come to disrupt daily business. In a political context such extreme outliers are usually not events that fall from the sky but rather the result of movements and opinions that have been brewing for some time but have been underestimated for too long. Not trying to paint a gloomy picture, the world is on a good path in many ways. Diseases are getting eradicated and billions of people are lifted out of poverty. But there are some frightening mega-trends that alone or in combination could suddenly disrupt this path. The Western (and now the world’s) economic system has created unprecedented wealth but also stark inequality. This is not necessarily sustainable and a backlash may be inevitable when too many people realise that they are in a low income trap or feel otherwise excluded. Continued automisation only adds to this and many people may no longer be content with receiving more and more things for free while themselves being transformed into ‘the product’ and paying the poor people’s tax, which is advertising. What good is it to have made millions of dollars when social unrest can threaten everything you have earned? Especially in the face of these very real threats it is necessary to, on one hand, take people’s concerns seriously and on the other to fight public opinion that goes against a free society. The ruling elite is often too self-righteous, for example, when simply demanding lower taxes without realising that this undermines the very system they are profiting from. Perhaps more subtly, those who are profiting from automisation and the information economy should be acutely aware of how this gradually makes swathes of jobs redundant. What good is it to have millions of dollars when social unrest can threaten everything you have earned? Of course, most think that such a scenario is sufficiently unlikely. I beg to differ. Just as more and more businesses are realising that ‘economic black swans’ have to be reckoned with, so should civil society not rule out ‘political black swans’ but see them as distinct possibilities that have to be averted. Germany already has a generous social welfare system. Its society is more equal than many other Western comparables. And still, people seem to fear for their future enough to fall behind right wing radicals as migrants enter the country. The one million or so refugees that Germany took in are, of course, no economic threat to the country whatsoever. In fact, most respectable research institutes expect immigration to have a positive effect on an otherwise ageing society’s economy. So what is the issue here? Are Europeans and Germans in this particular example just xenophobic by nature? Maybe but I wouldn’t like to think so. Europe makes a much bigger deal out of ‘integration’ than immigrants’ countries such as the U.S. or Brazil do. What is true, is that Europe makes a much bigger deal out of ‘integration’ than immigrants’ countries such as the U.S. or Brazil do. Germans are genuinely worried about how ‘integratable’ the new arrivals are. In America this almost takes the opposite extreme where Chinese immigrants live in Chinatown and may not even learn English for a generation or so. This is obviously true for other groups as well. On the New York subway, about a third of all advertising is now in Spanish. I feel like this would have caused outrage in most European capitals (except for Spain’s I suppose). The reason for this cultural difference is that most Americans still feel as immigrants themselves and as part of one minority or another. Even white Christians are (unlike in Europe) split across many different small independent churches and sects. It is a nation of minorities. Therefore, ‘fitting in’ means that you simply have to respect the law but other than that you can be a ‘good American’ by living in Chinatown and speaking Chinese or by being a Jew in Brooklyn who can’t (and maybe wouldn’t anyways) pick up his laundry on a Saturday because the Chinese owner of the dry cleaners in his area knows that most of his clients don’t shop on Saturday so he just closes his shop, too. In Germany, by contrast, a good immigrant must by popular demand be so ‘well-integrated’ that he or she is as indistinguishable from a white Christian as possible. Politicians regularly say phrases that include talk about ‘Our Christian values…”. What exactly are those values? And why are they “Christian values” anyways and not values of the enlightenment, which would surely be more fitting in 21st century Europe? No, the reason why Europeans (by example of the Germans) are so worried about migrants in their country is that they feel that their current way of life will change. But that’s where the problem lies. Their way of life most definitely will change! That’s a fact – migrants or not. Technology, demographics, … there are many reasons for this. Humans don’t like change. It causes terrible anxiety in most and makes them vulnerable for radical opinions. The root of the problem is not so much change itself as the fear of it. Maybe the debate should actually focus on what really defines a country and what are the real values that are inseparable from that country, that should be carried forward into the future. What Europe should always defend is the rule of law, which includes freedom of speech but also freedom of religious expression. But this doesn’t seem to be obvious. There is no reason why this couldn’t be upheld, even if 1o million refugees came to Germany. I don’t believe that the judiciary is so incapable. If it were then that would be a problem in itself, which has nothing to do with refugees. Contrary to what most people seem to think, the reason why refugees come to Europe in the first place is to live under such a system and not to undermine it. most people in Germany simply are Christians and therefore kind of expect a Christian state. The debate about core values seems to be long overdue. There is a reason why in Germany the separation of state and church, proposed during the Enlightenment for very good reasons, was never implemented. The German government collects taxes for the Vatican and all children in public schools have to take mandatory religion classes with crosses hanging in every room. This is hardly how Immanuel Kant would have imagined the 21st century. The reason why things are still run this way is because a state is not much more than a social contract and most people in Germany simply are Christians and therefore kind of expect a Christian state. That is fine. But what does it mean by extension? Should the majority of Germans always be Christian? Should the government introduce quotas? To me, all of this talk doesn’t make much sense since I think of a country as more than just the religion or colour of its people. However, by thinking that the separation of state and church should finally be implemented in Germany, I am already considered a radical by most. Until Europeans realise that humanity has bigger fish to fry than making sure that all of their neighbours eat the same food, look the same or believe in the same theological concepts as they do rather than just believing in things like equality of all before the law or enjoying a good litre of Weissbier together, we have some serious potential for conflict. Comparisons to the time of the second world war are often misleading but given that it was Holocaust Remembrance Day last week and that my world view is heavily influenced by this particular part of history, I should probably include an anecdote, which leads to my way of thinking. After the compatriots of my ancestors in 1930s Germany decided that it was no longer ok for them to be a part of the society they helped to shape, they were forced to become refugees – like millions of others, too. As successful, generous and politically engaged industrialists, they would have never in their wildest dreams thought that this could happen just a few years earlier. It was a ‘political black swan’. As a result, I now have family in South America, the U.S. and the U.K. (owed to the Kindertransport, which saved my grandfather’s cousin) but none left in continental Europe, where no one survived except for one wonderful aunt who survived the concentration camps and now lives in the US as well. Great-great grandfather Gustav wouldn’t have thought in his wildest dreams that his descendants would have to flee his beloved Germany. A few years ago, when an American cousin who had never been to Germany visited me in Europe, I thought it would be interesting to see the place where our great-grandparents lived as proud German Jews before WW2. Surprisingly, the cemetery we found was a bit desolate but otherwise completely untouched. As this was a remote town, close to Nurnberg, it was probably simply forgotten at the time when everyone was busy vandalizing other stuff. 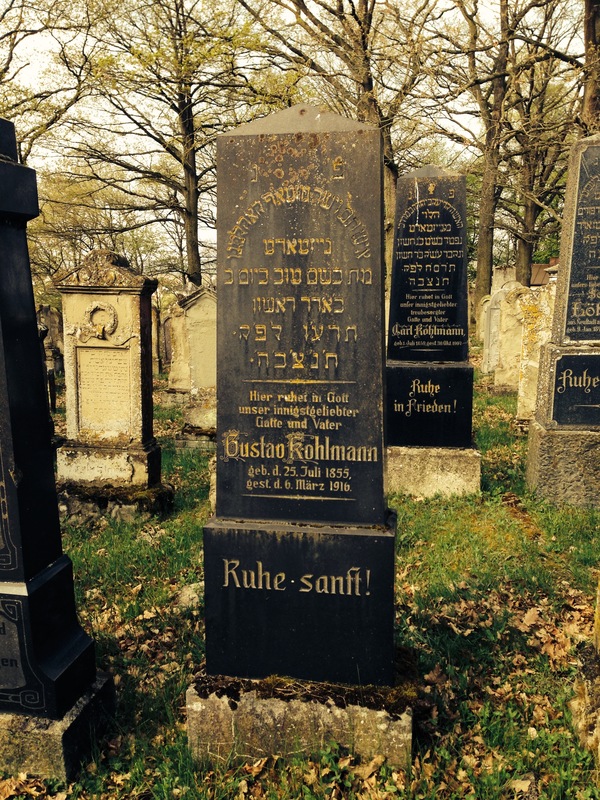 Even more astonishingly we found our great-great grandfather Gustav’s grave among many others of our family. Standing there, I thought to myself, what if Gustav would have seen what happened to his treasured country only a few years later? Of course, he wouldn’t have believed it. It made me acutely aware that political black swans are real and they always will be. What our story also told me is that, while some members of my family escaped, there were ships full of desperate refugees turned away at the shores of the U.S. only to return to Europe to be burned in the ovens of Germany. Yes, Europe does have a moral obligation to help. Not out of a sense of guilt but out of a sense of conviction. What the Holocaust also taught me was that following love over hate is always the right thing to do in the long run. Showing compassion has never brought down a society. Hate has. While this sounds like a hippie-type argument, I think of it as a good moral compass and indeed a political recipe. Doing the right thing generally has a way of paying off in the long-term. 40% of the largest U.S. companies were founded by immigrants or their children. At the end of the day, all people want to live in peace and security. Europe has rebuilt itself as a bastion of peace and universal rights. No number of refugees near the current levels or even substantially above this are a threat to this but an opportunity. No one profited from the immigration waves of the world wars like the U.S., which boasts countless immigrants’ success stories. According to an article in Forbes, 40% of the largest U.S. companies were founded by immigrants or their children. I am not arguing that the process of letting in refugees should be uncontrolled but the time has certainly come for Europeans to throw their fears overboard and start welcoming refugees with confidence instead of with Molotov cocktails and work towards an enlightened future together.